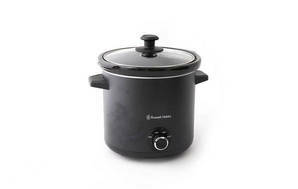 Snapshot: The Russell Hobbs 4L Slow Cooker RHSC4 has a capacity of 4L. How easy is it to use and how well does it cook? Excellent result for corned beef. Excellent result for chilli beef. 3 settings (keep warm, low, high). Lid handle has protection from hot surface (but handle is small). Easier to store than other models (it’s tall and round). Cooking bowl has small handles with no grip (so can be difficult to lift when full). Bowl handles can become hot. "Not a 4L slow Cooker"
24 Nov 2018, Peter B.
I just got this for $60 at Briscoes so can't comment on Pros yet. Although the name and box says this has a 4L capacity, I measured the volume it holds (up to the level were the lid sits - i.e. the usable volume) and it is only 3L. I am amazed that a Consumer product test didn't identify this issue! In fact this product test is all pretty poor really. There is no comment about actual volumes, whether the outside gets excessively hot (as some reviewers have noted), what temperature the low & high settings cook at (does it overcook as other reviewers have noted on some products). If you are going to do tests Consumer, be thorough!